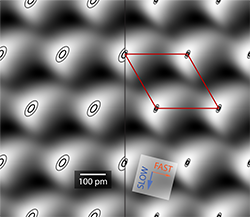 The scanning tunneling microscope (STM) provides an atomic view of surfaces with picometer precision. In recent work, graduate student Mitch Yothers working in the Bumm group has demonstrated analytical tools the group is developing to extract statistical information from STM images. The example above starts with a 25 nm × 25 nm atomically resolved image of graphite which contained 11,372 unit cells (not shown). 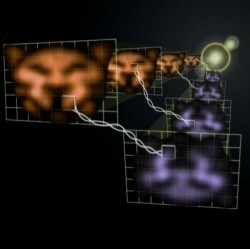 After removing systematic distortion from the image and identifying the location of each atom in the image, the unit cell images can be averaged to produce the averaged unit cell images (gray scale). 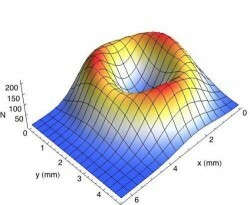 The standard deviation of the location of the atoms is shown as 1 σ and 2 σ atomic confidence intervals (ellipses). 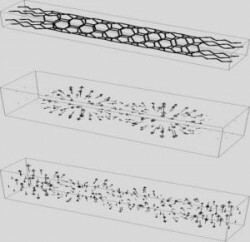 On the top is a model of a carbon nanotube (CNT) to which alkane chains have been attached. Below are “bad” and “good” normal modes for conduction of heat through the system, as calculated by Abdellah Ait-Moussa, a student working with Prof. Mullen. 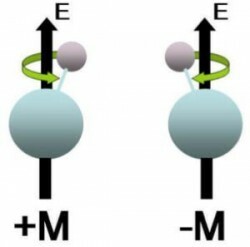 A “bad” mode only couples to atoms in the CNT; a good one couples to the side chains as well as the CNT, so that the vibration and the energy it carries goes through the whole system. The goal of the research is to optimize the side chains to maximize the flow of heat. 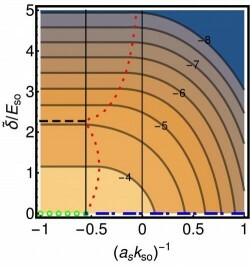 Improving heat conduction into CNT’s may lead to plastics that conduct heat as well as metals. Research Highlight: That Vacuum Is Really Something! 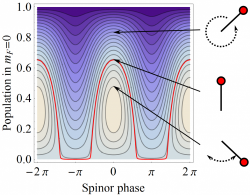 One effort of Prof. Milton and his research group is to understand the nature of the quantum vacuum, which is important in explaining dark energy as well having applications to nanotechnology. 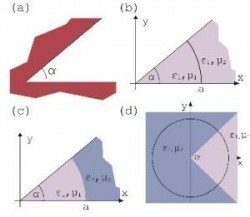 The images of cylindrical wedges may be relevant to understanding the quantum nature of cosmic strings, while the corrugated surfaces represent an idea for building nano-gears, in which the mechanical bodies never touch each other, but in which forces and torques are transmitted by quantum vacuum energy. The image shows a candidate W boson production event at the Atlas detector at Large Hadron Collider (LHC) at the CERN international research facility. The LHC is a proton-proton collider operating at center-of-mass energy 7 trillion electron volts. 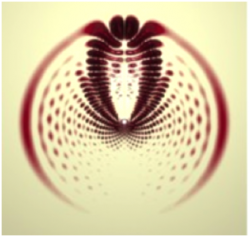 In this event the W boson has decayed to an electron plus a neutrino in the final state. 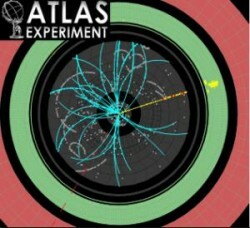 The OU High Energy Physics group is heavily involved with the LHC Atlas detector. 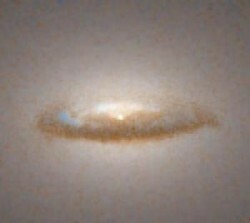 Active Galactic Nuclei (AGN) such as the one imaged here by the Hubble Space Telescope, are the most luminous, persistently emitting individual objects in the Universe. They can be seen at the largest distances, and provide a probe of the early Universe after structure formation. Used as a background light, absorption lines in their spectra trace nonluminous matter. They are powered by accretion onto black holes, and are key for understanding black hole demographics and the black hole mass function. Prof. Leighly works to understand how the primary physical parameters for black hole accretion, the black hole mass and accretion rate, manifest themselves in the broad band continuum and line emission from AGN. 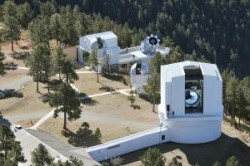 The University of Oklahoma has signed a 3-year lease agreement with the Astrophysical Research Consortium in Sunspot, NM (see the press release), giving its undergraduate students, graduate students, postdocs, and faculty access to research-grade 3.5m and 0.5m telescopes at the Apache Point Observatory. After being trained to use these facilities on-site in NM, OU astronomers will operate these telescopes from their offices in Norman. The agreement will help elevate OU’s astrophysics research profile and provide invaluable educational training to OU students. The Ring Nebula was formed when a Sun-like star nearing the end of its life ejected part of its atmosphere into the interstellar medium. The nebular gas itself is heated by the UV continuum from the remnant of the original star visible at the center of the Ring. Also shown is a slitless spectrum of the Ring, where an image of the nebula appears at wavelengths of bright nebular emission. 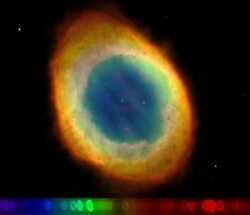 Planetary nebulae are useful in Prof. Henry’s research in determining properties of the interstellar medium as well as for studying the evolution of stars like the Sun. Credits: Image, Hubble Heritage Team (NASA); Spectrum: Julie Skinner (former OU Astronomy undergraduate), using the 2.1 meter telescope at KPNO.